A couple of firsts in todays blogpost…the start of a new series (Nuremberg Explored) as well as the first guest photo featured on Streets of Nuremberg. I’m the only one seriously into photography in the family, despite my efforts to get my kids more involved. My wife Birgit used to shoot a lot as well, but lately she’s dropped the cams and is snapping away at what she likes with her iPhone 6splus. And when we’re out all together I’m frequently picked on because I take so much time for my picture taking that the rest of the gang complains they need to wait too long before I’ve captured what I want to capture. But she still tolerates (thanks honey!) my hobby and takes interest in my activities like starting “Streets of Nuremberg”. 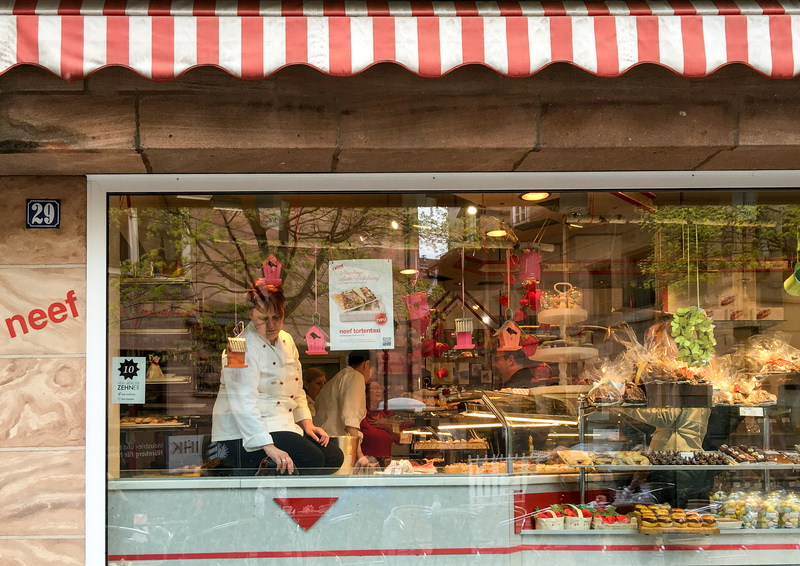 Sunday she showed me her picture of a shop window of a famous café in the Old Town of Nuremberg with a lady being busy cleaning next to an assortment of the most delicious pastries. And she asked my if this would be something worth posting on the blog. Besides making the wife happy is obviously first priority I really like the pic. And it inspired me to not only feature guest posts on the blog in the future when the opportunity arises but also start a series “Nuremberg Explored” in which I want to convey to my readers various sights, locations and specialities of my historic hometown for their enjoyment and as inspirations for future visits. Because this city has much more to offer than just being a great location for street photography. So here is the story of the first “explored” location. Birgit was in town with two friends on a culinary city tour. These relatively tours led by a professional city guide combine the history of Nuremberg’s Old Town with its culinary delights. These 2 1/2 hours walking tours combine sightseeing with some tastings of food-samples of some of Nuremberg’s original dishes. My wife really liked this tasty, sociable and fun tour. And on this tour she took the photo of the shop window of Café Neef. Founded 1972 by swiss patissier Karl Neef and his wife Ingrid their confiserie is Nuremberg’s premier location for seductive sweets. Today run bis Karl’s son Florian this traditional café won many awards for their cakes and pastries and also introduce innovative concepts like Nuremberg’s first torte taxi and they participate in the “Taste of Nuremberg” culinary tours. Definitely a place to stop for coffee and pastries when you are visiting the Old Town. Altstadt, Café, Café Neef, cake, City, coffee, Confiserie, culinary, Franken, Frankonia, Gebäck, Germany, jummy, kulinarisch, lecker, Metropolregion, Nürnberg, Nürnberg entdecken, Neef, Nuremberg, Nuremberg Explored, Old Town, pastries, sightseeing, Stadt, StoNur, Straßenfotografie, Street-Photography, Streets of Nuremberg, torte, Tour, tourism, Tourismus, touristic, Wie schmeckt meine Stadt? I’m really enjoy your series of posts on your home town, thank you Marcus. Oh, you are so kind! The reflections from the street blend in seamlessly so the waiter/chef on the left appears to have a magnificent rack of antlers. I love that.